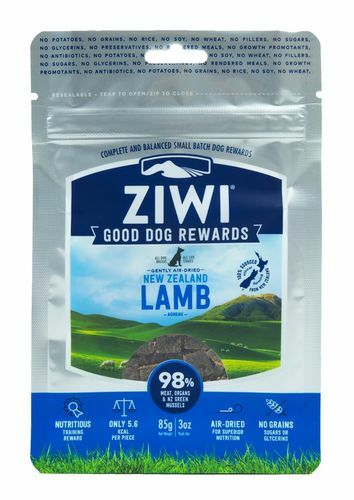 A single-protein option for dogs with protein allergies or sensitivities, Ziwi Lamb is sourced only from local New Zealand farms, ensuring the animals are free-ranging, grass-fed and finished. For the perfect finishing touch, we add kelp as a natural vitamin and mineral source, and New Zealand Green Mussel for natural glucosamine and chondroitin. Ziwi Peak Air-Dried Lamb may help promote: •Decreased food allergy sensitivities •Healthy skin and coat •Improved digestion •Joint health and mobility Ingredients Lamb, Lamb Heart*, Lamb Liver*, Lamb Tripe*, Lamb Kidney*, Lamb Lung*, Lamb Bone, New Zealand Green Mussel, Inulin from Chicory, Dried Kelp, Sea Salt, Parsley, Minerals (Potassium Bicarbonate, Zinc Amino Acid Complex, Copper Amino Acid Complex, Selenium Yeast, Manganese Amino Acid Complex), Vitamins (Vitamin E Supplement, Vitamin B1 Supplement, Vitamin D3 Supplement, Folic Acid). Naturally preserved with mixed tocopherols. *Depending on seasonal availability will be temporarily substituted with sheep.